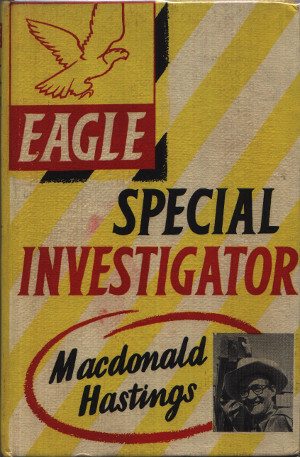 Eagle Special Investigator MacDonald Hastings begins with MacDonald explaining how the book came about. He states: "In his heart of hearts, I think Marcus Morris was always sorry that I didn't kill myself. For your sake, too, I'm sorry that this book hasn't a more bloodthirsty ending". And so begins a series of reports on adventures which were first published in the Eagle Comics and also in Eagle Annual Number One as Real Life Adventures. Dimensions : 14cm x 22cm with 215 pages. "I'm coming with you," he said. "My job is to get the pictures of you when you drown." Like the fool I am, I said it was jolly decent of him. Unlike the horse, I didn't know what was coming to me. Twelve stallions rose on their hind legs and, pawing the air over my head, gave me the proudest salute I have ever had in my life. "I've got to fly an aeroplane." "Jolly good show," said the R.A.F. type. "Circuits," she said, "are the basic method of flying training. We teach you to take off and fly round the points of an imaginary square, landing on the same line you used for the take-off run." "The Cresta Run," he said, "is the oldest, fastest and most exciting course for tobogganers that exists in the world." The blades were about eleven inches long, the handled another six inches. A Centurion weighs 49 tons. Se we're trusting you with forty-nine thousand pounds. Whenever I mentioned the matter to likely-looking people in the kilt, they stared back at me as suspiciously as if I were suggesting a raid on the crown jewels. My face was blackened with powder and, sure enough, I'd baptized myself as a pyrotechnist by collecting a burn on my arm. Pull him up on the hook and then let him down on it again to the ground. "An excellent idea," said Lieutenant Breese, "let him try it both ways." My own ambition, ever since I was a boy, has been to find myself on the box of a Christmas car mail-coach, with four steaming horses in front, striking sparks with their hooves off the highroad. In fact, after the event, my greatest regret was that I didn't have a dagger to chase Umbark Ben Taharb and his Filthy Camel all the way across the desert to Baghdad or Mecca or wherever it is. To put up that performance they were travelling on the straight at 130m.p.h. Apart from finding a gold-mine, looking for bears, felling trees and driving a dog team, the round trip is about fifteen thousand miles. A notice outside the office hut in Copper Canyon Camp said: "YOU NEEDN'T APPLY FOR A JOB HERE UNLESS YOU'RE A SAFE WORKER." That seemed to rule me out. I went to sleep dreaming of sitting in the engineer's seat of the biggest single-coupled cylinder locomotive in the British Empire. Mincing along in his high-heeled cowboy boots, Dave led us into the corral. "Don't touch him," said Doug Betts quickly. "If you do, he'll have you. He's crossed with a wolf, and he's not used to the smell of a white man." "You're no use dressed like that," he said. "You'll need muk-luks, a duffle with wolverine fur and a Grenfell windcheater." "How many claims can you stake in a year?" "Six, that's all." "A bear?" we said together. So, on the whole, I suppose I oughtn't to be disappointed that we didn't catch a tunny. I ought to be grateful that the whale didn't catch me.